Want to be notified of new releases in gregtomasch/EM7180_SENtral_Calibration? Tlera Corporation offers a popular set of attitude and heading reference system (AHRS) boards known as the "Ultimate Sensor Fusion Solution" or USFS. The heart of the USFS is EM Microelectronic's EM7180 sensor fusion coprocessor, which uses PNICorp's “SpacePointTM” adaptive fusion algorithm. With proper sensor calibration, the USFS can readily provide heading accuracy of ~2deg RMS or better. The original USFS is based upon the EM7180, TDK/Invensense's popular MPU9250 9DOF accel/gyro/magnetometer chip and Bosch's BMP280 barometric pressure sensor. This version of the USFS board has enjoyed wide acceptance by many different users for numerous applications. However, TDK has announced that the MPU9250 has reached end-of-life and production will soon cease. Last year Tlera brought out a successor to the original USFS that is based upon the EM7180 and the latest suite of ST Micro low-power MEMS sensors. They include the 6DOF LSM6DSM accel/gyro, the 3DOF LIS2MDL magnetometer and the LPS22HB barometric pressure sensor. Initial characterization of the ST-based USFS board shows that it delivers performance that is every bit as good (if not better) than the Invensense-based USFS. The ST-based USFS is fully pin-for-pin compatible and behaves essentially the same as the original USFS. The only differences are in the exact register writes to the EM7180 to set up output data rates (ODR's) and low-pass filter (LPF) cutoff frequencies. 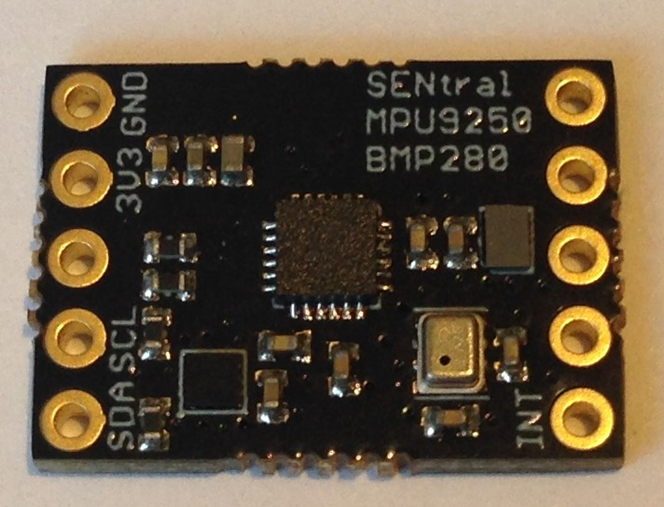 This is because the available accel/gyro ODR's and LPF settings do not exactly match the MPU9250 and because the ST magnetometer and baro sensors both have LPF capabilities that are not supported by the MPU9250 and BMP280. All these settings must be addressed correctly for the ST USFS to operate properly... But if they are, the performance of the ST-based version is excellent. As many users already know, there are many scholarly articles and PowerPoint presentations on the internet that attempt to explain the basics of quaternions as applied to orientation estimation. Most of these references fail to deliver a set of useful transformation equations because one crucial point is neglected at the beginning: The coordinate system definition. All the transformations to go from quaternions to rotation matrices and then to Euler angles are all of the same algebraic form... But the axis indices are all potentially different because they depend upon the coordinate system definition. There are several popular coordinate system conventions used in orientation estimation. The SpacePoint algorithm in the EM7180 uses the "North, East, Down" (NED) convention that is the standard for aeronautical applications. It should be noted that the firmware inside the Sentral rotates the individual sensor axes to conform with the NED convention. This means any given axis on any given sensor may or may not coincide with Sentral's corresponding axis, depending upon how the sensor chip is oriented on the circuit board. For example, in the photo above the PCB stencil is showing the orientation of the accelerometer's X-axis (East) while the Sentral's X-axis is actually in the "North" or forward direction. The sketches in this repository are written so the Sentral's sensor data registers are defined with respect to the NED convention. No matter which version of the USFS is chosen, the EM7180 must be configured properly and the MEMS sensors must be calibrated correctly to obtain optimal performance. This can be readily done so that robust AHRS results are obtained but it requires proper attention to detail in both host MCU coding and sensor calibration procedures. Accuracy of the Sentral's pitch and roll estimates ultimately depends upon correcting the offsets and scaling errors of the X, Y and Z accelerometers. 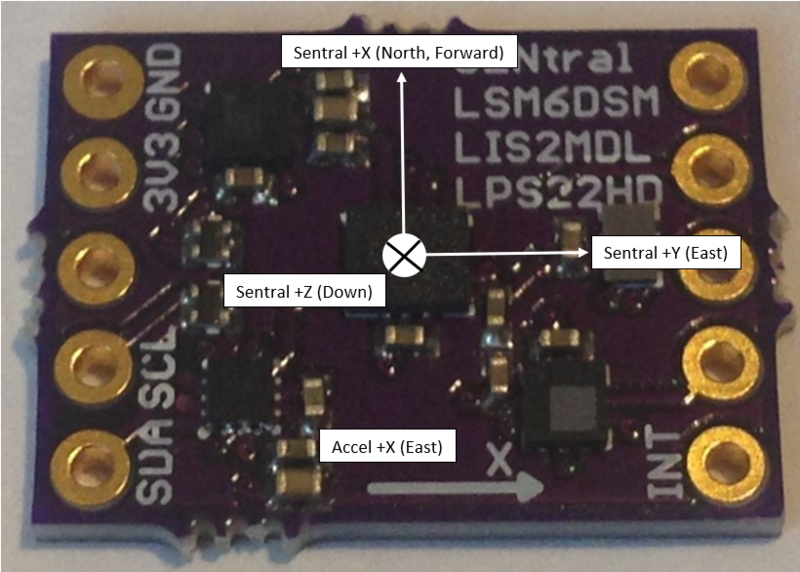 The Sentral's adaptive algorithm assumes that the three-axis accelerometer data are correct on their face and DOES NOT address any underlying accelerometer sensor errors. However, the EM7180 is capable of reading accelerometer error correction data from a set of input registers and applies these corrections throughout runtime. The offset and scale corrections are calculated from readings collected when each axis is aligned first parallel and then anti-parallel to gravity. As a practical matter, the USFS is aligned and held in six separate calibration orientations (X, Y, and Z aligned parallel and anti-parallel to gravity). Gravitational acceleration data are collected, averaged and stored in the on-board I2C EEPROM. These six readings are fetched from the EEPROM at startup and are loaded into the Sentral's accelerometer correction registers. Magnetometer calibration dominates heading estimation performance. Unlike the accelerometers, the magnetometers are internally calibrated by the Sentral's "SpacePoint" adaptive heading algorithm. It corrects for the "Hard iron" and "Soft iron" non-idealities of the X, Y, and Z magnetometers as well as effects from stray ferromagnetic materials and steady fields surrounding the USFS. However, for the SpacePoint algorithm to adapt, the USFS board needs to be slowly rotated throughout 3-space. You can tell when the SpacePoint algorithm has reached an adequate solution by monitoring the "Algorithm Status" byte of the EM7180. When Algorithm Status = 8 and the indicated heading is steady, the Sentral has reached "Stable calibration". It would be rather impractical to "teach" the SpacePoint algorithm (by rotating the USFS randomly throughout all of 3-space) every time the USFS is powered up in order to get good magnetometer calibration. Fortunately, the EM7180 has a "Warm Start" feature that eliminates the need for such tedium. The EM7180 can be paused to transfer the effective parametric "state" of the SpacePoint algorithm to the on-board I2C EEPROM at any time. 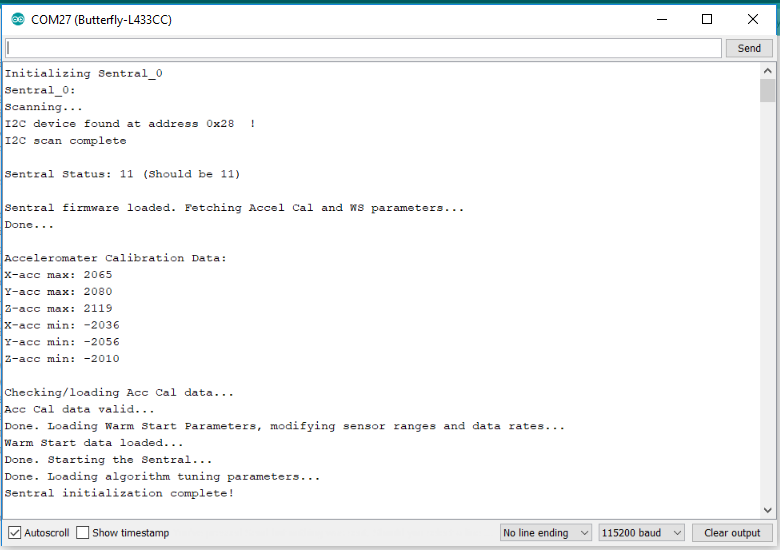 The same algorithm state parameters can be retrieved from the I2C EEPROM and loaded into the EM7180 at startup... So once the algorithm has "learned" and properly calibrated the magnetometers, that information can be stored and then restored every time the EM7180 is initialized. 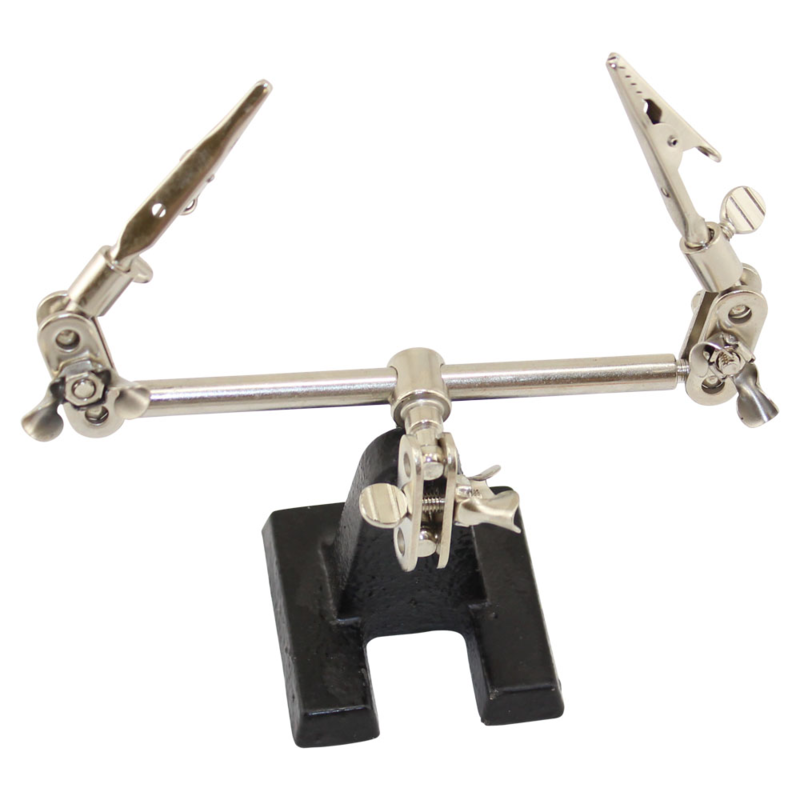 Gyroscope calibration is by far the simplest as it requires no effort on the part of the user. The Sentral does not attempt to correct for gyroscope scale errors but it does automatically correct zero-motion biases. The algorithm assesses when the USFS is not moving and uses the "At rest" data to predict and correct the individual gyroscope bias estimates Examination of the angular velocities reported while the USFS is at rest shows the bias auto-correction method works very well. 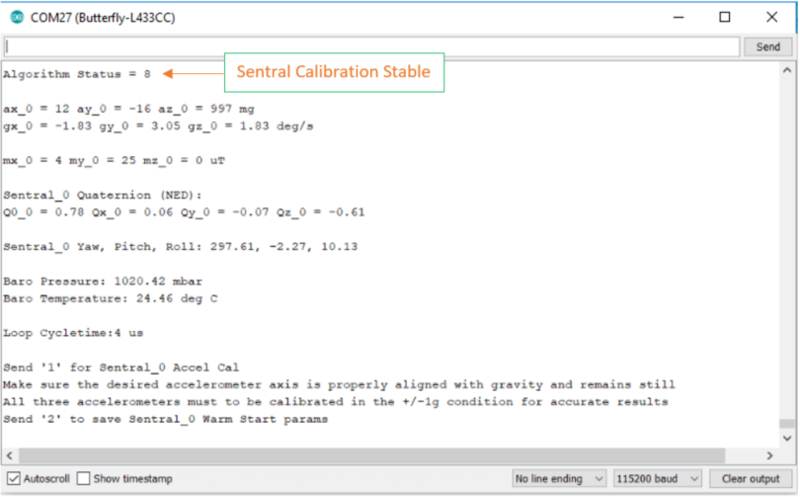 The accelerometer calibration data are displayed as part of the Sentral startup procedure. The data are in ADC counts where 1g = 2048. If all three accelerometers were perfect, maxima and minima would all be +/- 2048, respectively. If any of the data vary more than +/-~10% from their target values, the entire calibration is judged as invalid and is not loaded into the Sentral. Rotate the USFS throughout 3-space as described above. You should see the "Algorithm Status" field toggle to "8". This means the SpacePoint algorithm has achieved "Stable calibration"
The sketches in this repository have a certain degree of feature adjustability that is set by parameter definitions in the "config.h" header file. In general, these parameter definitions should only be adjusted with care. This section will describe the adjustable performance features and offer some guidance for their adjustment. Wherever possible, there is a "pick list" of supported options for each parameter category. UNCOMMENT ONE OPTION PER LIST ONLY. The specific entries in each pick list reflect the allowed parameter values for the individual sensors. SENSOR_0_WIRE_INSTANCE: This definition specifies which of the microcontroller's available I2C busses will be used for the USFS. 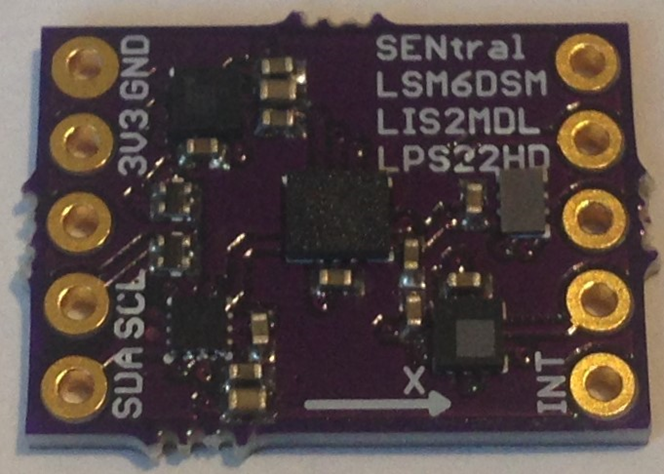 For the STM32L4 and ESP32 development boards, there are several possibilities. For the Teensy 3.X only the primary I2C bus is listed. There are supplementary definitions for the I2C SCL and SDA pin specifications, if necessary. The low-pass filters remove high-frequency noise from the sensor data streams going into the Sentral but also induce sensor phase delay. This tradeoff between noise suppression and phase delay is typically done by trial-and-error. The Invensense sensor set only offers LPF's for the accelerometers and gyroscopes. The ST sensor set offers these plus LPF's for the magnetometers and barometric pressure sensor. The entries in the LPF cutoff frequency pick lists range from least aggressive to most aggressive. As described in an earlier section, the stored accelerometer calibration and Warm Start parametric data is tested for validity when it is retrieved from the EEPROM and before it is loaded into the EM7180. However, in some instances the user may wish to suppress loading of the accelerometer calibration and/or Warm Start parameters. 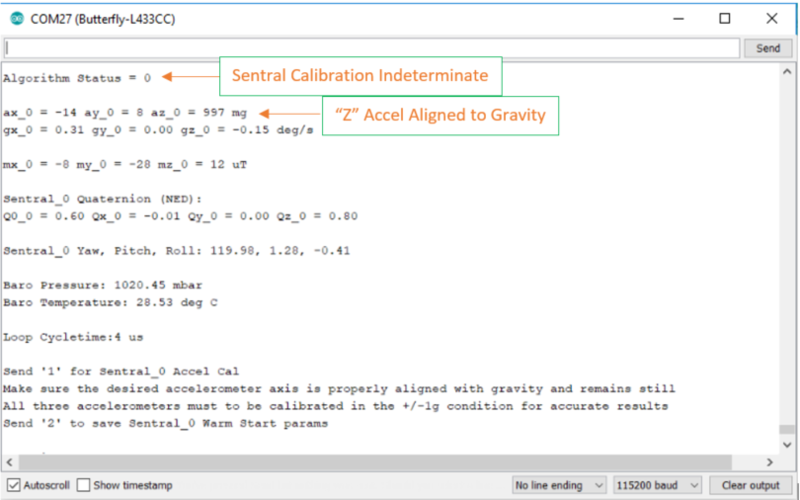 The "ACCEL_CAL" and "SENTRAL_WARM_START" definitions are used to activate or deactivate automatic loading of valid calibration data. By default, they are defined as "1" to activate calibration data loading. Either or both can be defined as "0" to suppress calibration data loading. Finally, to provide accurate heading the magnetic declination for your location needs to be defined. Simply look up your magnetic declination and define "MAG_DECLINIATION" as a floating point constant in decimal degrees.